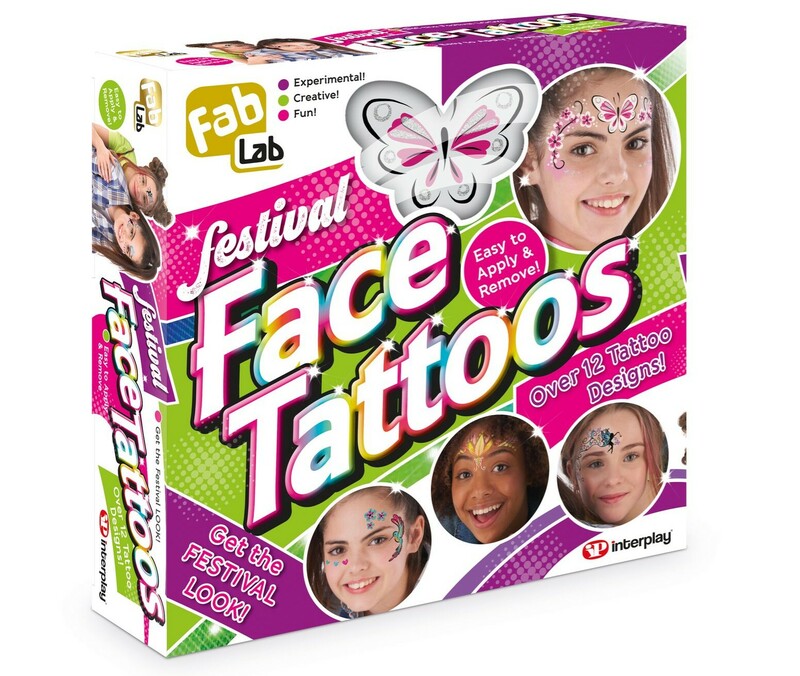 Get the coolest Festival Face Tattoos look and be party ready with FabLab in minutes. These beautiful face tattoos are the coolest look for festivals this summer. With the new FabLab Festival Face Tattoo set from Interplay, you and the kids can look spectacular for festivals in no time. Apply gorgeously sparkling and elegantly designed glitter and matt tattoos with ease. Every pack comes with over 12 intricate and utterly glamorous or fun and cute designs that can be customised for an individual look! Vibrantly coloured, you can find one to match your outfit! And they are easy to remove again too, so you can go from glam to natural as you please. And they contain no harmful chemicals and are fully tested and 100% non-toxic. I'd give it to my niece for her birthday. The girls would wear them while out for the day. My two girls would love it for parties and bbqs! My niece would use it when she has her friends over. Days out and birthday parties. For my daughter when she has play dates with her best friends. My god-daughter Talulah. She loves face painting and this goes one better. At my daughter's birthday party! this would be wonderful for my nieces birthday thank you - love it! I would use this with my niece Chloe, she is going to watch her favourite characters at the theatre so she would wear the tattoos! At my daughters birthday party. for parties or weekends away out ! Probably every day before going anywhere knowing my daughter if I won this for her. For our next round of Birthday parties coming up in Sept/Oct. For my little cousin's birthday party. at home for when my daughter loves to dress up! We would use it in the kids faces and maybe their arms! I think my daughter and her cousin would have tons of fun using these - not that they are going anywhere special, I think they'd just be a fun wee thing to do at nanny's house together! We would obviously use it immediately... hehe... then possibly save some for parties.. maybe! We are going to a festival in September, I'd use these there. I would give this to my niece who would have a lot of fun with it! I don't think this would float my nephew's boat! However, I would love to win for my prize bag at school, my students would love it. With my daughters on an awesome family sunday. My daughter would love it for her birthday party. I would play with this with my daughter, she loves this kind of thing - great invention. We would love to use it when we go camping.